Create convincing image blends with this 3D guide. Why do some photographs look flat and others look like they have depth? This is usually due to how blurred the background looks. This effect is controlled by a camera’s aperture and is defined on a camera by its f-stop (or t-stop on some movie camera lenses). Understanding aperture will help sell 3D movie scenes by giving a true ‘movie’ look, a sense of scale both large and small. As always, once the fundamental rules have been understood, the artist will be able to creatively subvert them in order to achieve their own desired effects in their 3D movie projects. 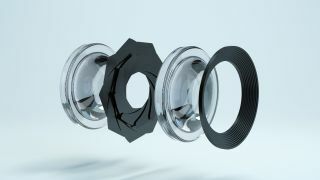 In terms of how a lens works, the aperture is created by the number of blades that close over the lens – in just the same way that an eye’s iris closes up in bright light. When the camera aperture is wide open, a lot of light comes in and the depth of field is reduced. Altering the depth of field enables us to blur any of the unwanted elements in a scene. Having a shallow depth of field means that everything other than the focused object is blurred, and a large depth of field means that everything in the scene is sharply in focus. ‘Bokeh’ is a term that is used when discussing lens performance, especially at wider apertures, and it refers to the quality of the blurred highlights. Understanding bokeh is critical if working in VFX to match CGI to existing footage, as many lenses have distinctive bokeh due to their differing construction. The size of a camera’s sensor is also important for understanding apertures, a lens with an f-stop of 1.8 on a 50mm lens on a smartphone looks very different to a lens with exactly the same numbers on a full-frame camera. Aperture is one of the most creative tools available to photographers in the field and the same can be said when working with CG cameras. 01. What is an f-stop? The f-stop refers to how wide the lens aperture is. The lower the f-stop number, the more light the lens lets in. For example, in the left-hand image above, this real camera lens has been adjusted to its lowest f-stop of 2.2, and as you can see the glass is clear. In the image on the right, the f-stop of the same lens has been set to its highest f-stop of f16. The aperture blades can be clearly seen, which reduces the amount of light that passes through the lens. The effects of this aperture/f-stop difference can be recreated in digital content creation software. Nearly all of the main applications have camera objects with the ability to switch on an ‘aperture’ function, which usually mimics the familiar camera f-stop paradigm. As can be seen in the image the difference between f2.2 and f16 is marked, with the f2.2 on the left only showing what is being focused on and f16 on the right image showing all of the elements within the image. Bokeh refers to the way a lens ‘renders’ the out-of-focus elements of a scene. Bokeh is dependant on the type and brand of lens, how wide the aperture is and the number of metal blades that the aperture is constructed of. Bokeh works best with illuminated elements in the background, which can create highlights from which the details in the bokeh can be derived. Custom shapes can even be used to created patterned bokeh for more advanced looks. One of the most common mistakes is to create CG scenes with inappropriately blurred backgrounds, in situations where this background blur would not occur if shooting an image in the real world – effectively creating ‘impossible lenses’. This can also have a drastic impact on the scale of a scene. For example, a city scene created with blurred bokeh backgrounds would be reminiscent of a toy or model, rather than an actual city shot with a much larger depth of field due to its scale.